Southern Skywatch July, 2013 edition is now out! Southern horizon at 10:00 pm local time on July 1. The July edition of Southern Skywatch is now up. There's still some nice planetary action this month with Jupiter, Mars and Mercury meeting. Mars climbs higher to the morning sky and is near the crescent Moon on the 7th. It is joined by Jupiter which is close to Mars on 21-24 July. 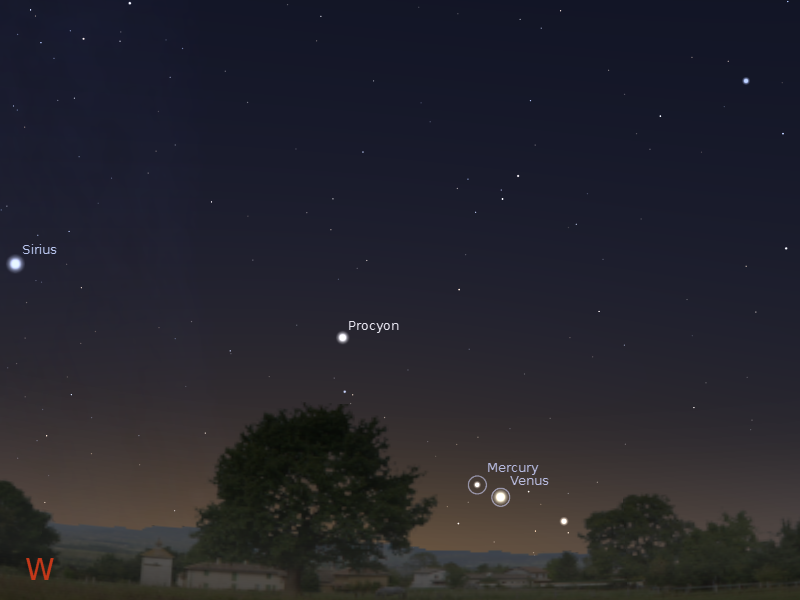 Mercury returns to the morning sky and is not far from Mars and Jupiter in the last weeks of the Month. Saturn was at opposition in April, but it is still big and bright this month. On March 17 the Moon is close to Saturn. On the 10th the crescent Moon is close to Venus. Gliese 667 C f (Exoplanet names in triple star systems are confusing) looking back towards it's primary (Gliese 667 C) and the binary it orbits (Cliese 667 A and B). Also visible are several of the other planets in the system. Visualised in Celestia. Click to embiggen. 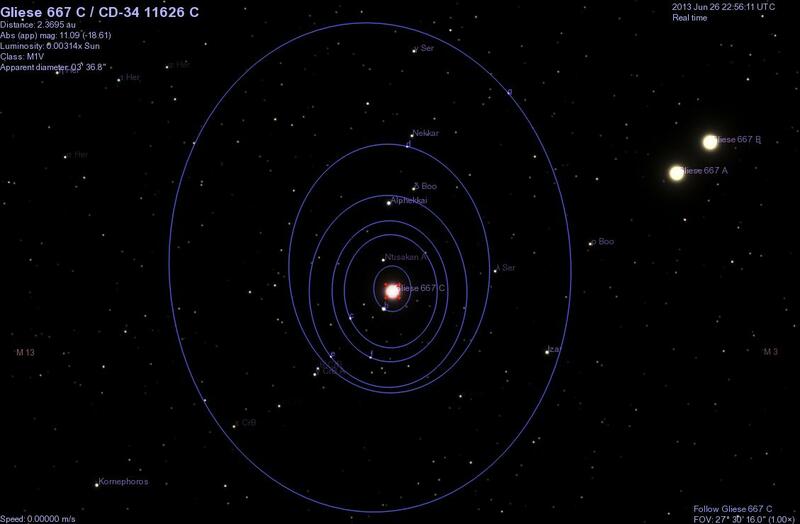 The Gliese 667 C system. I have tilted the orbital plane sightly so that all three stars in the triple star system can be seen. Our search for extrasolar planets keeps turning up science-fiction worlds! The latest is a planetery system around one star in a triple star system that hosts not one, but three planets in its habitable zone (c, f [illustrated above] and e). The Gliese 667 system is well known, lying 22.1 light years away in Scoripius. 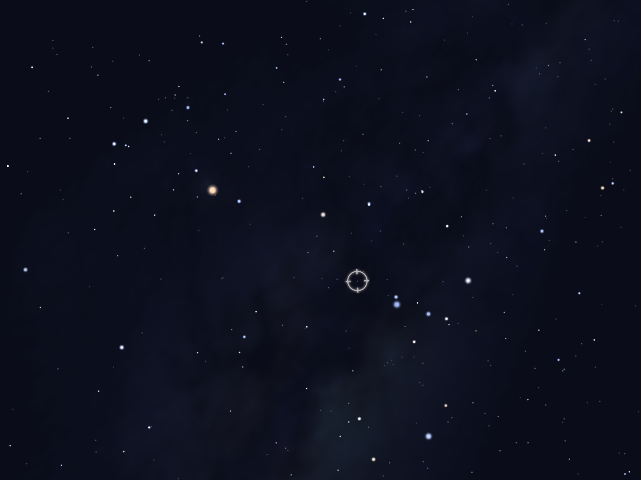 The system is (just) visible to the unaided eye as a single dot of magnitude 5.9 (see image of Scorpius to the left, the Gliese system is circled, click to embiggen). We already knew that there were three planets around Gliese 667, but longer data collection and reanalysis found more of them. While there is a lot of to-do about habitable zones, it simply means the zone where liquid water can exists on a planets surface. Other factors may be involved in habitability too. Mars is in our habitable zone, but was too small to hold on to a substantial atmosphere, and is now a freezing desert. The M star these planets revolve around is potentially a flare star, with powerful solar eruptions that may make life difficult on these planets. We also don't know if they are rocky worlds of water worlds. Still, the growing inventory of stars with terrestrial style planets in their habitable zones suggests that the possibility of life on other worlds is not remote. The ESO press release is here, and nice backgrounders from the Universe Today and Space.com. Once again I've made Celestia files for the system. As usual, copy the data here to a plain text file (GJ667.ssc), copy the file to the Celestia extras folder. Celestia already has Gliese 667 triple star system, so you don't need to have a star definition file. The images you get from Celestia look a bit different to the artists interpretations in the press release, in part because of the way the stars and planets are rendered in Celestia, and in part because of how the stars orbit is defined. But it will still give you a good feel fro the system. I'll have to update my Celestia Exoplanet Tour as well. AltSurface "limit of knowledge" "Gliese 667 C/b"
AltSurface "limit of knowledge" "Gliese 667 C/c"
AltSurface "limit of knowledge" "Gliese 667 C/d"
AltSurface "limit of knowledge" "Gliese 667 C/e"
AltSurface "limit of knowledge" "Gliese 667 C/f"
AltSurface "limit of knowledge" "Gliese 667 C/g"
There are confirmed aurora from Tasmania (Sandy Bay, Cygnet, Bicheno, Wynyard) and Southern Victoria, Bz is -11 nT, K index 6 and the Australian IPS has issued an aurora alert. People in Tasmania, Southern Victoria and Southern New Zealand should go out and look now, reports are that the aurora are fading in and out, but if you find a dark sky spot, and let your eyes adapt, if you look to the south you may see shifting glows and pillars of light. Some displays are reported to be spectacular. Carnival of Space #307 is Here! 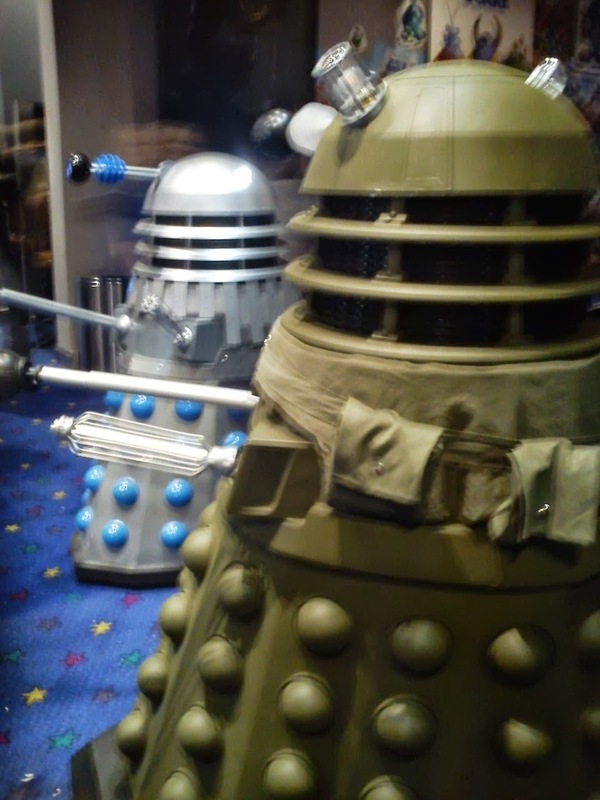 Carnival of Space #307 is now up at Links Through Space. There's Finnish Solargraphy, starship designs, the Arkyd Space Telescope, Thierry Legault's amazing shots of Shenzhou 10 and much, much more. Head on over and have a read. The Last Quarter Moon is Sunday June 30, this is a "Blue" Last Quarter Moon. Mars rises in the morning twilight. Venus and Mercury pull apart in the evening twilight. Saturn is high in the evening skies. The Last Quarter Moon is Sunday June 30, this is a "Blue" Last Quarter Moon. That means it is the second Last Quarter Moon of the Month (the first was on the 1st of June). While not as deeply entrenched in our mental mythology as "Blue" full Moons, they are still nice to think about. Evening sky looking west as seen from Adelaide at 18:00 pm local time on Saturday June 29. Venus and Mercury have drawn apart. Similar views will be seen elsewhere at the equivalent local times. Click to embiggen. Venus and Mercury draw apart during the week. Jupiter is lost in the twilight, although technically it enters the morning twilight at the end if this week, it will be hard t see until next week..
Mercury is visible below Venus and continues to lower towards the horizon. Venus climbs higher in the evening twilight. It can be seen 20 minutes after sunset and is now reasonably easy to see up to an hour and a half after sunset. 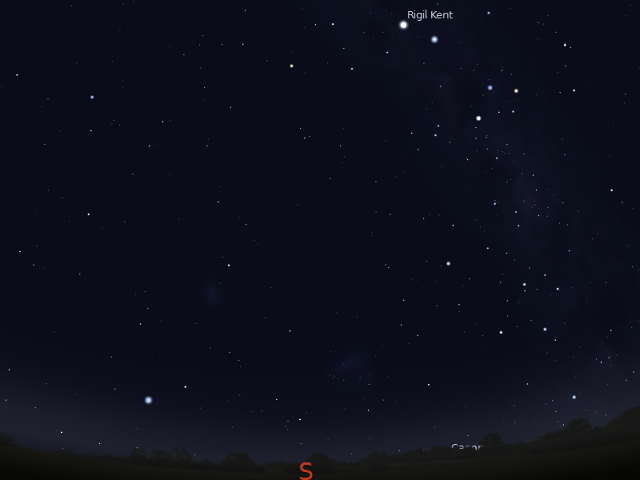 Saturn is easily visible above the north-eastern horizon in the early evening in the constellation of Libra. 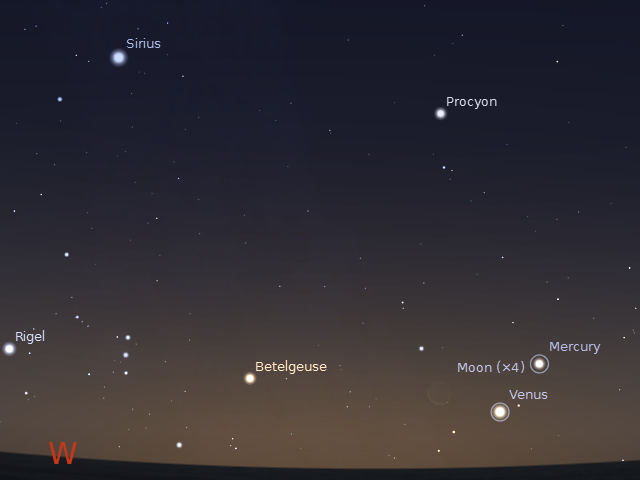 By 10 pm local time it is high above the northern-western horizon and very easy to see.This is an excellent time to view this planet in a small telescope, as there will be the little interference from horizon murk and air turbulence (and you can show the kids before they go to bed). At the start of the week Saturn is half a finger-width from the dim star Kappa Virginis, and is closest on July 1. Saturn, Arcturus and Spica from a broad triangle above the northern-western horizon. Opposition (when Saturn is biggest and brightest as seen from Earth) was on April 28. However, Saturn will be a worthwhile evening target for telescopes of any size for several months. The sight of this ringed world is always amazing. Morning sky on Thursday July 4 looking north-east as seen from Adelaide at 6:45 am local time in South Australia. Mars is below the red star Aldebaran in the twilight. Similar views will be seen elsewhere at the equivalent local time (click to embiggen). Mars rises in the twilight, but will still be hard to see unless you have a flat, clear horizon. It forms a triangle with two red giant stars, Aldebaran and Betelgeuse. There are lots of interesting things in the sky to view with a telescope. Especially with Saturn so prominent in the sky. If you don't have a telescope, now is a good time to visit one of your local astronomical societies open nights or the local planetariums. Especially during the school holidays. Just past Full Moon on June 24, 2012 at roughly 8:30 pm as seen from Adelaide (click to embiggen). While I missed out on Sundays Perigee Moon ( the so called "Super Moon") due to cloud (shakes fist at sky), tonight I was able to see the just-past-perigee Moon. After, of course, clouds blanked out Venus and Mercury again. And prevented me from doing anything artistic with the rising Moon. Anyway, this is a single image taken using infinity to infinity focussing, with my Canon IXUS (ASA 400, 1/500th second exposure) through my 20 mm lens with my 4" Newtonian. I've done an unsharp mask and increased the contrast a bit as the only processing. I tried to stack 5 images in Registax, but I couldn't get them to register (sigh). Still, not too bad if I say so myself. On Friday night I gave a talk to the SA branch of the Australian Air League. The Air League is a bit like Scouts, only with an aviation/avionic theme. They have their 80th anniversary coming up, and have applied to speak to the astronauts of the International Space Station. So that was where I came in, to give a talk that would give a wider introduction to the ISS and what the astronauts did. I divided my talk into the history and structure of the ISS, what science is being done on the ISS, school student participation in the ISS (did you know there was a LEGO-ISS collaboration to demonstrate how to build useful structures in microgravity), how to see the ISS for yourself and finally, what question would you ask a ISS astronaut. Preparation: I knew I was going to be giving a talk to a group of kids of differing ages and differing exposures to the ISS, I was sure some would have even more knowledge than me. 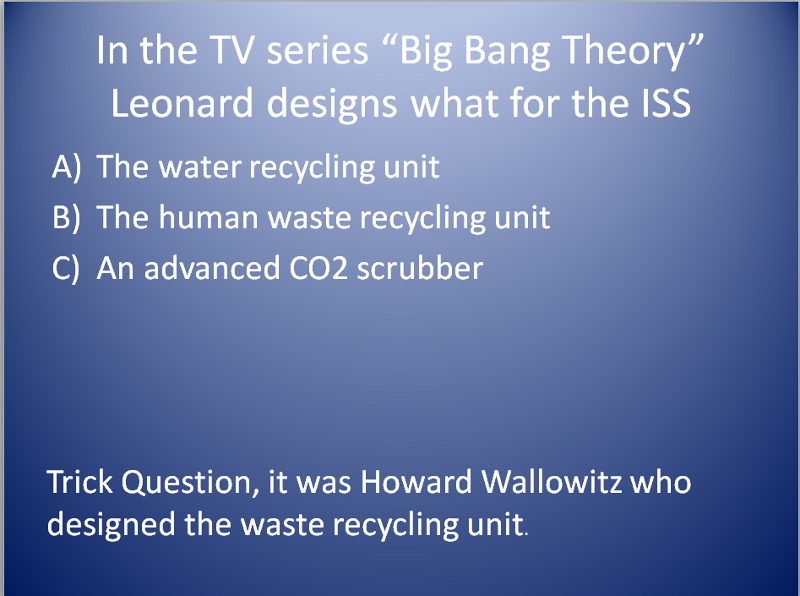 So to start off with, I made a short occasionally humorous quiz about the ISS. As well as establishing the kids base knowledge, this would also break the ice and make the session more interactive, instead of me just being a talking head. Preparation 1: I downloaded all the videos, embedded them, made sure they were in the same directory in the memory stick, tested the assembly on 2 different computers to make sure the animations worked. I exported the powerpoint in two different versions in case the laptop could only work with older powerpoints, I even exported the whole thing to PDF just in case neither power point presentation worked. I also made a copy onto CD in case the flash drive died. Preparation 2: I printed off a bunch of starmaps, so I could show the kids how to use star maps when looking for the ISS, I printed out a handout with all the links I used in the presentation to ISS prediction sites, star-maps and free photo manipulation software, and a bunch of make a paper ISS sheets. So how did it go? Fantastic! The kids (and kids at heart), were eager, engaged with lots of interesting questions. The "what would you ask an astronaut" session came up with some pretty good ideas such as "does time go faster on the ISS". Also, a jam biscuit makes a good prop for discussing protostellar dust disks. What didn't work so well? The weather didn't cooperate, so I couldn't do a live demonstration of the star-map use (I wasn't actually counting on it, and there were no ISS passes that night anyway). Despite extensive testing, the embedded videos didn't run in the powerpoint (I was able to run one later independently, then I ran out of time). I didn't print off enough ISS models (but that's because I ran out of ink printing them). I let the kids questions run on a bit too long (but on the other hand they were just so enthusiastic, it seemed a shame to rein them in). The next time I do something like this, I'll cut down on the slides so the kids can do more. Spend a bit more time on the hands-on, how to image the ISS yourself. And break out to stand alone videos rather than try and run them in power-point. Despite the glitches, it still went very well, more due to the kids than me. I had a great time (and it certainly looked like the kids had a great time). I really hope they get to speak to the ISS astronauts, they truly deserve it. No perigee Moon for me (inaccurately known as a "Super Moon"). Thick, orgulous cloud has cloaked the heavens, knocking out the Moon and Venus and Mercury close together. A few hopeful gaps in the cloud allowed us to go to the beach, where we stood in howling wind and drizzle crashing kites into the ground at high speed. sadly, these gaps in the cloud have not translated into anything useful astronomically. At least I get to stay inside near the heater. Earth is at solstice on Friday June 21. The Full Moon is Sunday June 23. At this time it will be closer to Earth than any other time this year (a so called "Super Moon"). Mars rises in the morning twilight. Venus and Mercury are close together in the evening twilight. Saturn is high in the evening skies. The Moon occults the bright star alpha Librae 2 on the 20th. The Full Moon is Sunday June 23. At this time the Moon will be at perigee, when it is closest to the Earth. This is the closest perigee for 2013 at 356989 km. A full Moon at perigee has been called a "SuperMoon", this is not an astronomical term, but an astrological one. 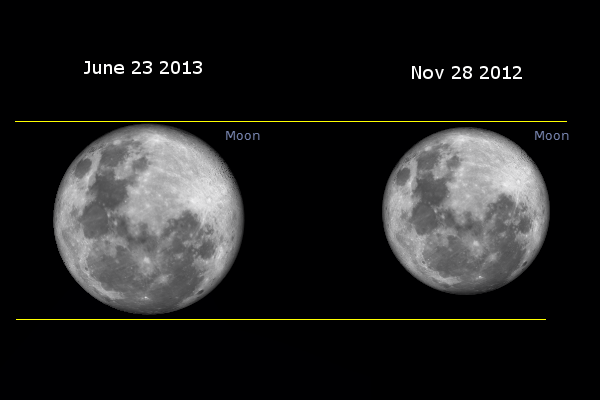 While the Moon is close, it will have no real effect (or be distinguishable without a telescope and a good memory). The Moon at Perigee and apogee as seen through a telescope. With the unaided eye, the Moon only appears half a finger-width wide, so the difference is much harder to see. This months Full Moon could appear up to 14% bigger and 30% brighter in the sky than average. But will you actually notice if it is different to the last Full Moon? The limit of distances that someone with good vision can distinguish between is 1 minute of arc (about the width of a human hair). So, for the vast majority of people any difference smaller than 1 minute of arc cannot be seen. The Moon this Full Moon will be 33'57" wide (just a touch over half a degree, around half a finger-width wide), last months Full Moon (358374 km) was 33'47" wide. Without a telescope and careful astrophotography you will not notice the difference. However, while the "SuperMoon" will not be spectacular, it will be a good photo opportunity, if you have a decent zoom on your camera, taking a photo of the Moon on June 23 and then again on January 16 2014 you will see a decent difference (you need to use exactly the same zoom enlargement, see Inconstant Moon for instructions). The evening sky facing east in Sydney on June 20 at 5:05 pm AEST showing the waxing Moon just about to cover alpha2 Librae. (similar views will be seen from other locations at a similar local time eg 5:08 AEST Canberra). The inset shows a telescopic view of the Moon at 5:05 pm AEST, with alpha2 Librae about to go behind the Moon. The waxing Moon passes in front of the bright alpha2 Librae in the constellation of Libra on the evening of June 20. Alpha2 Librae is a bright white star readily visible to the unaided eye (magnitude 2.8). The occultation will be seen from eastern Australia and South Australia. Everywhere else will see a nice, close approach. From Adelaide the star reappears from the bright limb at 17:23 ACST. From Brisbane the star reappears at 18:05 AEST (the disappearance behind the dark limb is too deep in the twilight to be really seen). From Canberra the star disappears behind the dark limb of the Moon at 17:08 AEST, and reappears at 18:08 AEST. From Hobart the star disappears behind the dark limb of the Moon at 17:28 AEST, and reappears at 18:07 AEST. 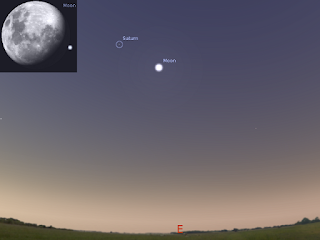 From Melbourne the star disappears behind the dark limb of the Moon at 17:13 AEST, and reappears at 18:03 AEST. From Sydney the star disappears behind the dark limb of the Moon at 17:06 AEST, and reappears at 18:10 AEST. With the Moon not far from Full, this event is really best seen with binoculars or a small telescope (especially for the reappearance of the star on the bright limb of the Moon). If you have a tripod or other stand for your binoculars, it will be much easier to observe. Set up about half an hour before the occultation to watch the star dissapear (so you are not mucking around with equipment at the last moment). Evening sky looking west as seen from Adelaide at 18:00 pm local time on Friday June 21. Venus and Mercury are closest at this time. Similar views will be seen elsewhere at the equivalent local times. Click to embiggen. Venus and Mercury come close together this week. From the 20th-23rd they are no further than two finger-widths from each other. On the 21st they are closest, being only a finger-width apart. Jupiter is lost in the twilight, it is in conjunction with the Sun on June 20. Mercury is visible above Venus but slowly lowers towards the horizon. 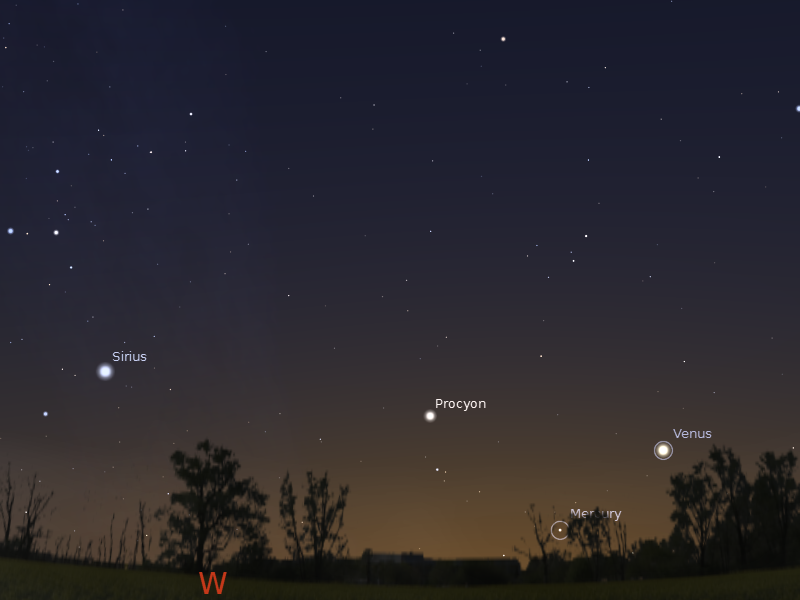 Venus climbs higher in the evening twilight, and catches up to Mercury this week. It is now reasonably easy easier to see up to an hour and a half after sunset. 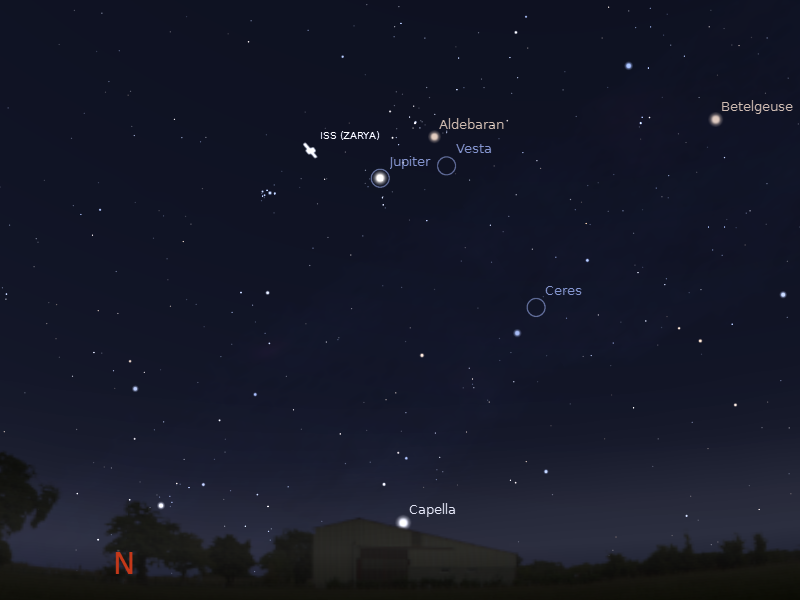 Saturn is easily visible above the eastern horizon in the early evening in the constellation of Libra. By 10 pm local time it is high above the northern-western horizon and very easy to see.This is an excellent time to view this planet in a small telescope, as there will be the little interference from horizon murk and air turbulence (and you can show the kids before they go to bed). By the end of the week Saturn is half a finger-width from the dim star Kappa Virginis. Morning sky on Sunday June 23 looking north-east as seen from Adelaide at 6:45 am local time in South Australia. Mars is below the red star Aldebaran in the twilight. Similar views will be seen elsewhere at the equivalent local time (click to embiggen). The Full Moon is Sunday June 23 in Australia. At this time the Moon will be at perigee, when it is closest to the Earth. 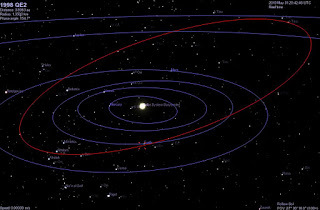 This is the closest perigee for 2013 at 356989 km. A full Moon at perigee has been called a "Super Moon", this is not an astronomical term, but an astrological one (see also here). While the Moon is close, it will have no real effect (or be distinguishable without a telescope and a good memory). This months Full Moon could appear up to 14% bigger and 30% brighter in the sky than average. But will you actually notice if it is different to the last Full Moon? The limit of distances that someone with good vision can distinguish between is 1 minute of arc (about the width of a human hair). So, for the vast majority of people any difference smaller than 1 minute of arc cannot be seen. The Moon this Full Moon will be 33'57" wide (just a touch over half a degree, around half a finger-width wide), last months Full Moon (358374 km) was 33'47" wide. Without a telescope and careful astrophotography you will not notice the difference. For a list of full/new Moons and the dates of apogee/perigee see here. If you can wait until January the 16th 2014, when the Full Moon is at Apogee, then it’s diameter will be 29'32" , and you could notice a difference if you have a good memory, but it won’t be spectacular. The illustration above is from November 28, 2012, when the Moon was at apogee and 29'33" wide when it was 406364 km from Earth. However, while the "SuperMoon" will not be spectacular, it is still pretty and will be a good photo opportunity. If you have a decent zoom on your camera, after taking a photo of the Moon on June 23 and then again on January 16 2014 you will see a decent difference (you need to use exactly the same zoom enlargement, see Inconstant Moon for instructions). And, no, we will not get earthquakes from the "Super Moon". Carnival of Space #306 is Here! Carnival of Space #306 is now up at the Urban Astronomer. There is a Black Hole Bonanza, science outreach in libraries, Martian Streambeds, robotics for space development and more! Clank on over and have a read. The evening sky facing east in Sydney on June 20 at 5:05 pm AEST showing the waxing Moon just about to cover alpha2 Librae (Zubenelgenubi). (similar views will be seen from other locations at a similar local time eg 5:08 AEST Canberra). The inset shows a telescopic view of the Moon at 5:05 pm AEST, with alpha2 Librae about to go behind the Moon. The waxing Moon passes in front of the bright alpha2 Librae in the constellation of Libra on the evening of June 20. Alpha2 Librae, which rejoices in the name Zubenelgenubi, is a bright white star readily visible to the unaided eye (magnitude 2.8). 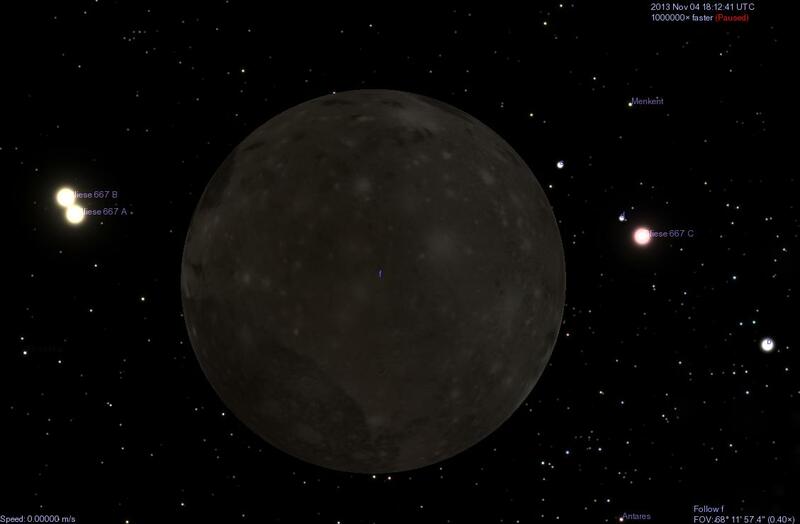 The occultation will be seen from eastern Australia and South Australia. Everywhere else will see a nice, close approach. Appearance and disappearance times are shown in the table below. With the Moon not far from Full (23 June), this event is really best seen with binoculars or a small telescope (especially for the reappearance of the star on the bright limb of the Moon). If you have a tripod or other stand for your binoculars, it will be much easier to observe. Set up about half an hour before the occultation to watch the star dissapear (so you are not mucking around with equipment at the last moment). Don't Forget CosmoQuest Hang-out-a-thon on Now! Faced with governmental funding cuts to science education and research, we have decided to go old school with a twist: On June 15-16, we are hosting a telethon using Google Hangout on Air – a Hangout-a-thon – to raise money to support public engagement in science. If you want to be part of this awesome hangout here's where you find out more. Venus and Mercury as seen from Largs Bay, Adelaide on 16 June at 5:50 ACST. This was taken with my Canon IXUS at ASA 400 and 0.4 of a second exposure. You will need to click to embiggen to see Mercury in this shot. Venus and Mercury as seen from Largs Bay, Adelaide on 16 June at 5:55 ACST. This was taken with my Canon IXUS at 3x Zoom, ASA 400 and 0.6 of a second exposure. Unfortunately the dust on the CCD chip ruins the picture a bit. The colours were more vivid in real life. After more cloud finally got a view of Venus and Mercury together. they are closing in on Each other and will be closest on the 22nd. Venus is really quite easy to see now. Most people will be somewhat aware that the US budget sequester has had a wide range of impacts, amongst which are the education and outreach services of NASA. Faced with suspension or closing down, the educators are trying to do something to keep going. In the words of Pamela Gaye. It starts Saturday 15 June at 11:00am US central time (UTC -5 hours, that's Sunday, 16 June 2013 at 1:30:00 AM, in Australian Central Time, and 2:00 AM AEST). There's a great line-up, and lot's of citizen science and activities for everyone. Carnival of Space #305 is Here! Carnival of Space #305 is now up at AARTScope blog. There's citizen science, a CosmoQuest 24 hour hangout-a-thon, hot gas in clusters, space apps for the iPad, 10 years of Mars express and lots, lots more. Rocket over and have a read (and apologies for missing a few weeks Carnivals while I was laid low with Flu, you can find past episodes here). The First Quarter Moon is Monday June 17. Mars rises in the morning twilight. 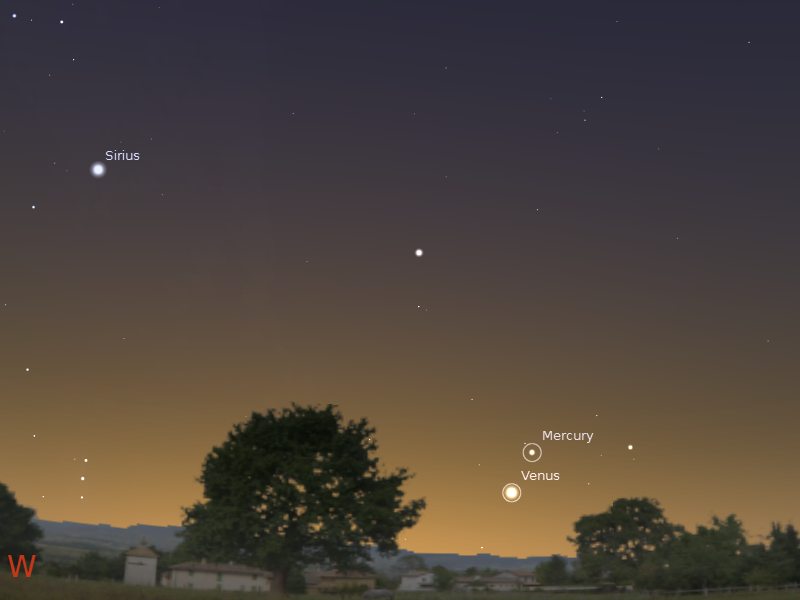 Venus and Mercury come closer together in the evening twilight. Saturn is high in the evening skies and is close to the Moon on the 19th. The Moon occults the bright star alpha Librae 2 on the 20th. The First Quarter Moon is Monday June 17. Evening sky looking west as seen from Adelaide at 17:45 pm local time on Saturday June 15. Venus and Mercury draw closer. Similar views will be seen elsewhere at the equivalent local times indicated here. Click to embiggen. Jupiter is lost in the twilight. Mercury is visible above Venus and becomes more visible as it climbs in the evening sky. Venus also climbs higher in the evening twilight, chasing Mercury. While It is still relatively close to the horizon, and you need a resonably clear, level horizon to see it at its best, it is becoming much easier to see. 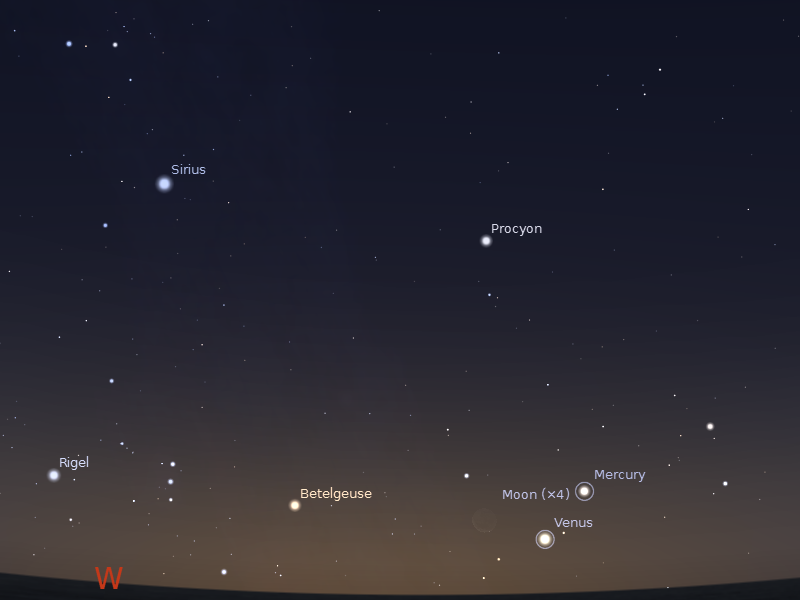 Saturn is easily visible above the eastern horizon in the early evening in the constellation of Libra. By 10 pm local time it is high above the northern horizon and very easy to see.This is an excellent time to view this planet in a small telescope, as there will be the least interference from horizon murk and air turbulence. Saturn, Arcturus and Spica from a broad triangle above the northern horizon. Morning sky on Sunday June 16 looking north-east as seen from Adelaide at 6:45 am local time in South Australia. Mars is below the red star Aldebaran in the twilight. Similar views will be seen elsewhere at the equivalent local time (click to embiggen). 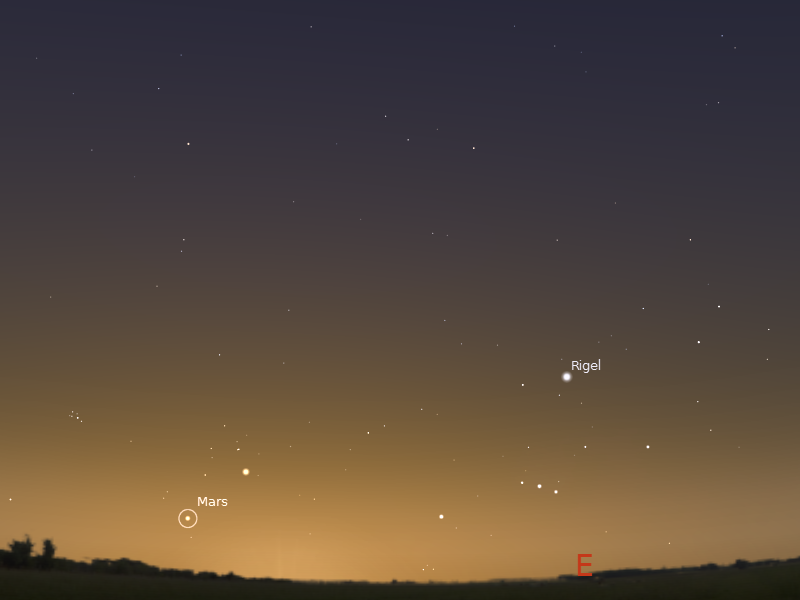 Mars rises in the twilight, but will be hard to see unless you have a flat, clear horizon. Venus, Mercury and the Moon as seen from Largs Bay, Adelaide on 10 June at 5:44 ACST. This was taken with my Canon IXUS at 3x Zoom ASA 400 and 1/8 of a second exposure. Unfortunately the dust on the CCD chip ruins the picture a bit, and you will have to embiggen the picture by clicking on it to see Mercury though. The colours were more vivid in real life, and the Moon, Venus and Mercury really easy to see. Venus, Mercury and the Moon as seen from Largs Bay, Adelaide on 10 June at 6:11 ACST. This was taken with my Canon IXUS at 3x Zoom ASA 400 and 4 seconds exposure. Mercury is easily seen to the upper right of Venus, and you can see the reflection of both the Moon and Venus in the water. Click to embiggen. 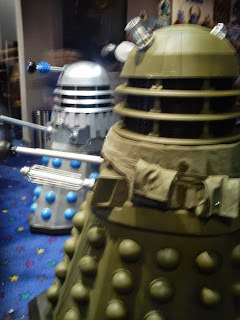 Taken with my Canon IXUS at 3x Zoom. ASA 400 and 6 seconds exposure at 6:15 ACST. Mercury is easily seen to the upper right of Venus, and you can see the reflection of both the Moon and Venus in the water much better than the last image. Click to embiggen. Taken with my Canon IXUS at 1x Zoom. ASA 400 and 6 seconds exposure at 6:17 ACST. Bord scale view, and you can see the reflection of both the Moon and Venus in the water again. Click to embiggen. Cloud has been my bane during the line up of Jupiter, Venus and Mercury. Days and days of cloud, even when the rest of the sky was clear, cloud would lurk around where the planets gathered. covering them totally. After a day of clear blue sky the clouds would gather at sunset. Well, I finally got to see the line-up tonight, after a spectacular sunset with just a few clouds glowing red on the horizon, the wire thin Moon, Venus and then Mercury popped out of the darkening twilight, as the horizon went through a a glorious series of colours. Eventually I got to see Earhshine and the reflections of Both the Moon and Venus in the sea. Brilliant. Tasmanians, NZ folk should go look NOW. Look to the South for unusual glows or moving lights, darks sky sites away from city lights have the best chance of seeing anything. Southern Victorians should be on alert too. field with a favourable alignment for generating Auroral activity. These solar wind conditions may continue for the next 24-48 hours. though likely confined to higher latitude regions (e.g. Tasmania). Montage of comet C/2011 L4 PanSTARRS from 2 June to 4 June 2013. Each individual image was a stack of 3-5 x 120 second frames taken in iTelescope T14, rendered as a PNG after a median Z-project applied, the 3 individual images were then stacked and (badly) rotated in ImageJ. click to embiggen. Inspired by Rolando Ligustri's montage, I had a go at making one myself. It didn't work quite so well, with the images of the 3rd having cloud interference (the middle image that is very difficult to see), and the 4th contaminated by the twilight. My attempts to rotate the image didn't work so well either. But it's proof of principle, I'll have another go later. 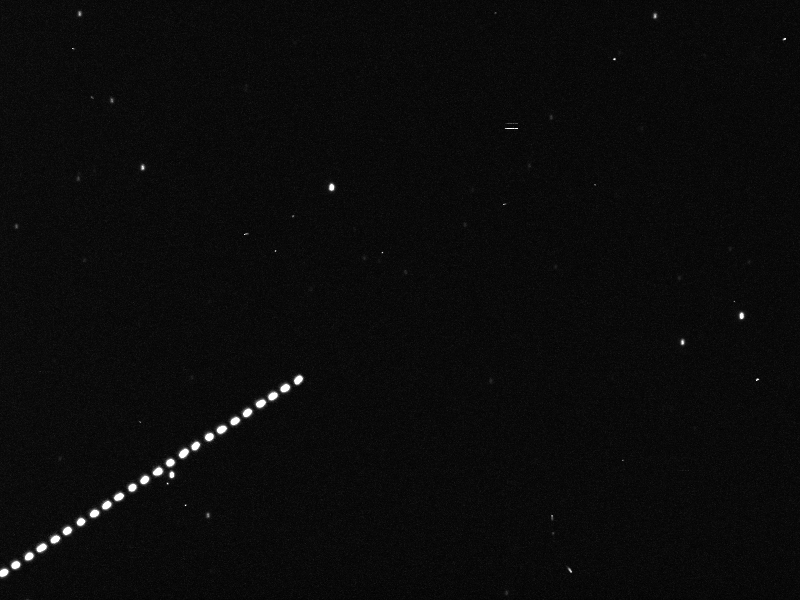 Asteroid 1998 QE2, 4 June, 9x10 second exposures stacked in ImageJ and MAX Z-project applied. 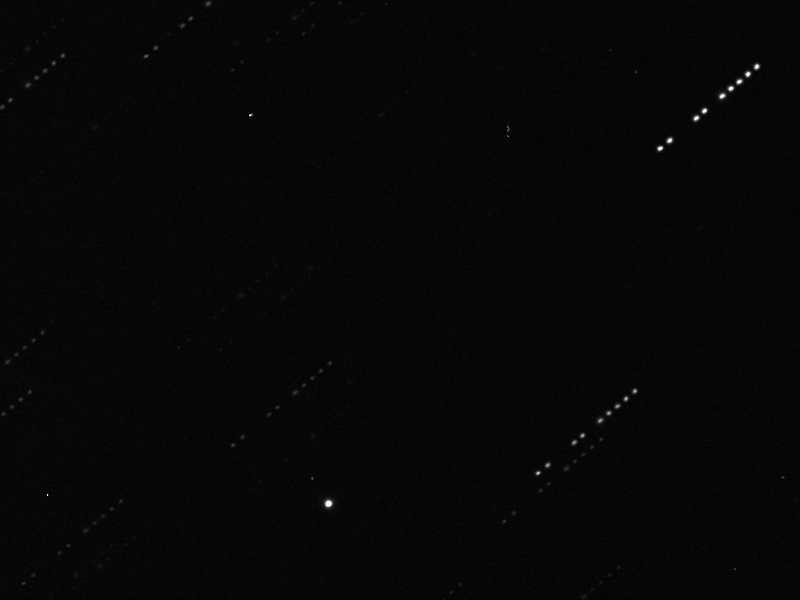 R filter, iTelescope T9 (click to embigggen). Animated GIF from the 9 frames, it's still zipping along. 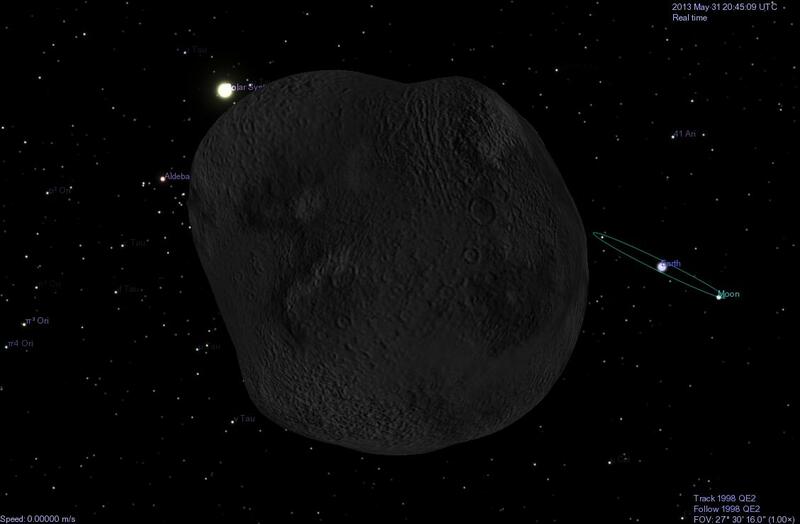 Although Near Earth Asteroid 285263 1998 QE2 is well past it's closest approach it's still a nice bright target. Compare today's pictures and animation with the ones from the 31st, from the 28th and the from the 24th. Bad weather has meant this is the first time I've had a chance to get any images since cloud ruined closest approach on the 1st. Still had a bit of a weather problem, but not bad enough to not get images. The New Moon is Sunday June 9. 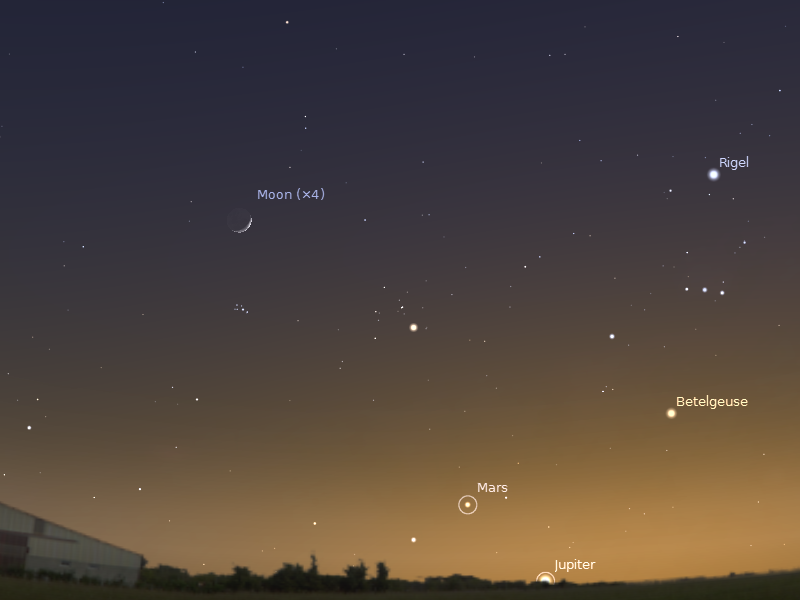 Mars returns to the morning sky and is close to the crescent Moon on 7 June. Venus and Mercury form are close to the crescent Moon on 10 June. Saturn is high in the evening skies. Evening sky looking west as seen from Adelaide at 18:00 pm local time on Monday June 10. The crescent Moon is close to Venus, below Mercury. Similar views will be seen elsewhere at the equivalent local times indicated here. Click to embiggen. The New Moon is Sunday June 9. The Moon is at apogee (furthest from the Earth) on the 10th. 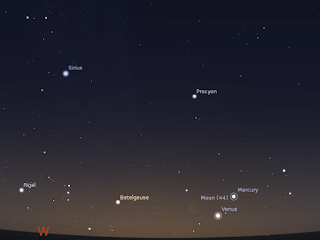 Venus and Mercury form a line in the evening sky this week. The crescent Moon joins the pair on June 10 and 11. Venus also climbs higher in the evening twilight. It is still close to the horizon, and you need a clear, level horizon like the ocean to see it at its best. However, it is quite visible soon after sunset, and becomes easier to see as the week progresses. Morning sky on Friday June 7 looking north-east as seen from Adelaide at 6:45 am local time in South Australia. The crescent Moon is close to Mars in the twilight. Similar views will be seen elsewhere at the equivalent local time (click to embiggen). 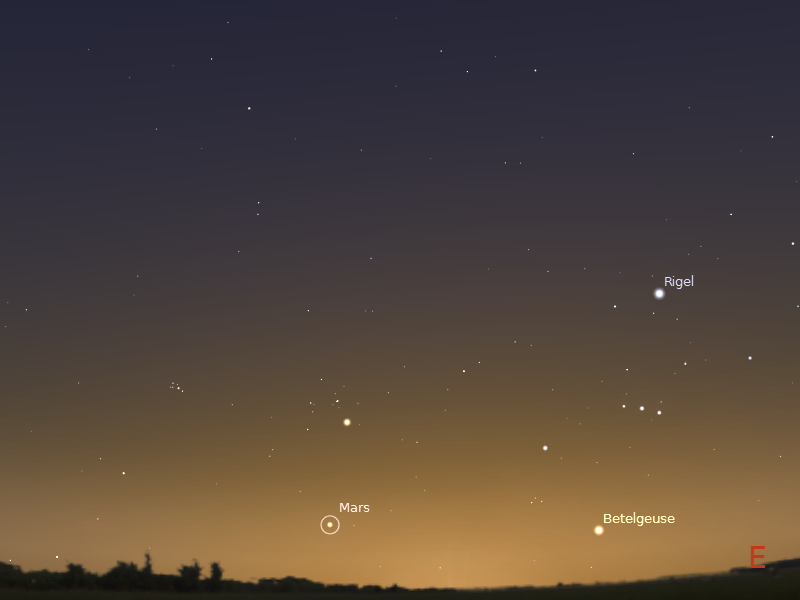 Mars emerges from the twilight, but will be hard to see unless you have a flat, clear horizon. On Friday June 7 the thin crescent Moon is close to Mars. 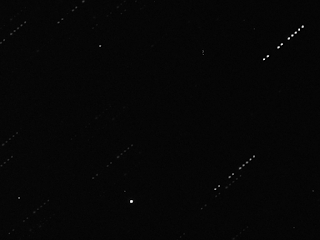 My mosaic of Comet C/2011 L4 PanSTARRS, 2 June 2012. Images taken with iTelescope T14. Each image is 5x120sec exposures, stacked in ImageJ then a median Z-project applied. the separate images were then stacked and rotated in GIMP. The tail of comet PanSTARRS stretches over 5 degrees across the sky, pointing to Polaris. 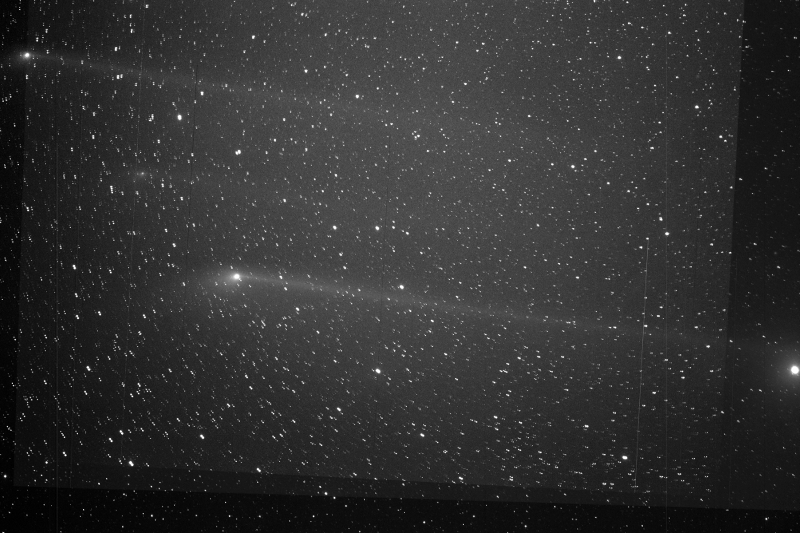 This is my second mosaic of this marvellous comet, but my previous one was too short and light contaminated. After bouts of bad weather and an embarrassing night where I couldn't work out which way the comets tail was pointing (and thus taking lots of images of empty sky), I finally got this beauty. Southern Skywatch June, 2013 edition is now out! Western horizon at 6:00 pm local time on June 10. The June edition of Southern Skywatch is now up. There is a "blue" Last Quarter Moon on the 30th. 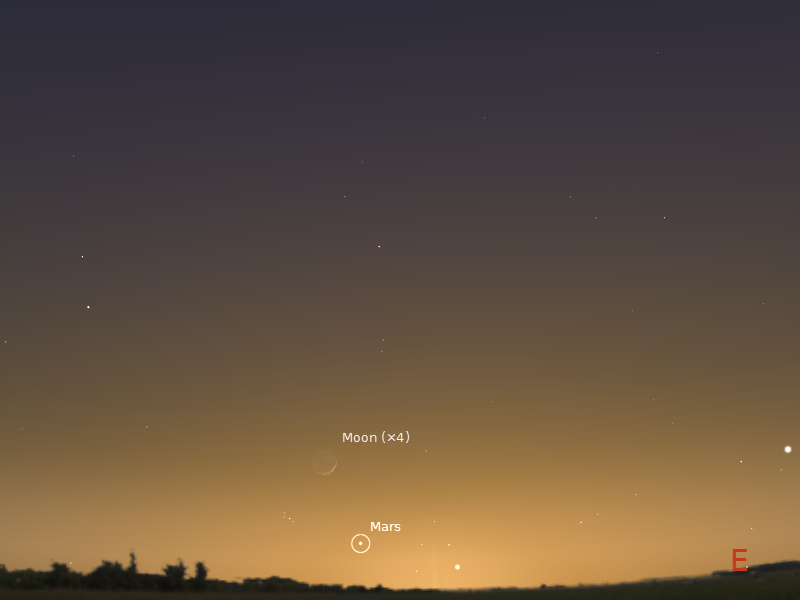 Mars returns to the morning sky and is near the crescent Moon on the 7th.. There's still some nice planetary action this month with Venus and Mercury meeting, there is also an occultation. Saturn was at opposition in April, but it is still big and bright this month. On March 19 the Moon is close to Saturn. Jupiter disappears from view this month. On the 10th the crescent Moon is close to Venus and Mercury . Venus and Mercury are close again on the 20th-23rd. The star alpha Librae2 is occulted on the 20th, seen from eastern Australia and South Australia. Everywhere else sees alpha Librae2 very close to the Moon. If like I am, you are clouded out of your view of Near Earth Asteroid 285263 1998 QE2 then why not try a Celestia simulation? You could also go to astroweb TV to see the live webcast of the flyby at the Virtual Telescope at 31 May, starting at 20:30 UT (that's 6:30 am AEST). For Celestia, copy the section below to a file names 1998QE2.ssc and place it in the extras folder. 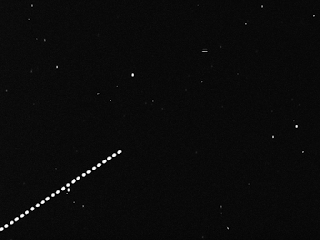 Asteroid 1998 QE2, 31 May, 24x10 second exposures stacked in ImageJ and MAX Z-project applied. R filter, iTelescope T9 (click to embigggen). Animated GIF from the 24 frames, it's really zipping along now. 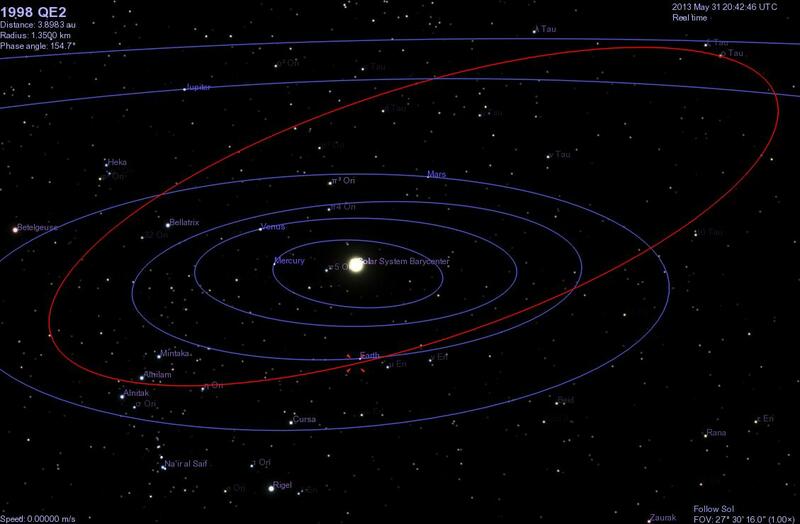 Near Earth Asteroid 285263 1998 QE2 is fairly hooting along now. Compare todays animation with the one from the 28th and the from the 24th. Closest approach is a mere 4 and a half hours away, but then the asteroid will be too close to the horizon to image (and now cloud is ruining my 1 July run). I'll have another go tomorrow.